One of the headaches of travelling to a cold country is figuring out what to wear so I don't die of heat stroke here, and not of frostbite there. I'm wearing thick black leggings and I've a thermal sweatshirt thing (from Uniqlo) in my bag in case. As usual, comment moderation has momentarily been turned on. Bye! P.S. 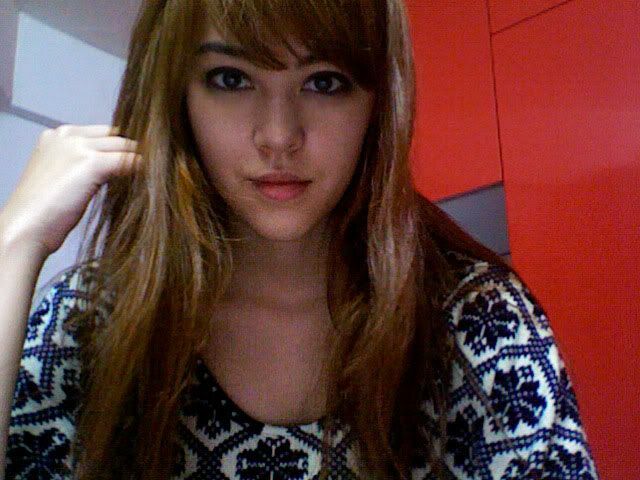 Had my hair done at Bugis Essensuals yesterday! 8 comments on "OFF TO KOREA!" going to korea for? alone? Eek! You look better in black hair. This is just....weird. It looks like a wig! that's definitely not enough for negative degrees! heh heh, i know why you went to seoul! you won a model award right? btw, how were jerry yan,shinee and snsd in real life?